I purchased a King Lizard size bottle of Coca Cola today; it is two liter of heavy liquid. What is the most common water bottle on the earth? It is the most recent bottle of purified water purchased by a traveler or tourist. 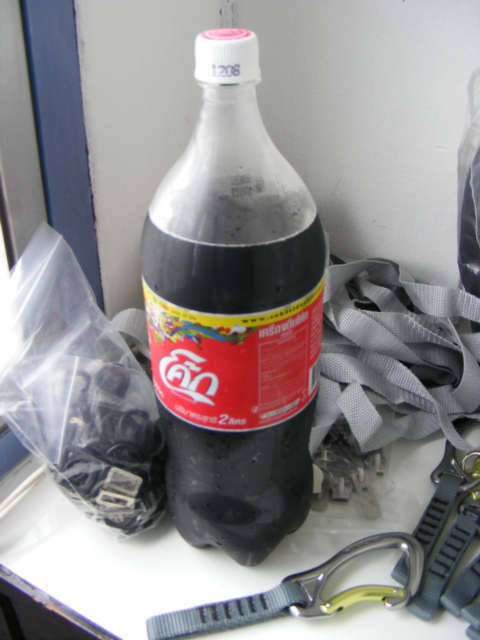 Two Liters of heavy liquid, this is a Coca Cola bottle with the Thai Language label. I needed this bottle to learn what the largest bottle I believe a person could, would or may carry on the side of a backpack. I am measuring this bottle, and will create a way to carry this size bottle and NOT HAVE IT FALL OUT of the Backpack. I do not use them quick load mesh pockets often, because things like to quick unload. I drink about 1.5-2 liters of water per day in my room, not counting the water or other drinks as I stroll around the world. Therefore, I figure a person needs about 2 liters of water, or could on rare occasions carry two one-liter bottles. I suppose with a family and kids some unlucky person could be carrying four liters.